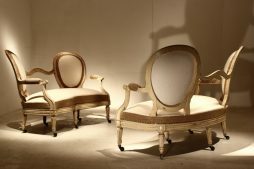 Antique Sofa | Interior Boutiques – Antiques for sale and mid century modern furniture, french furniture, antique lighting, retro furniture and danish furniture. 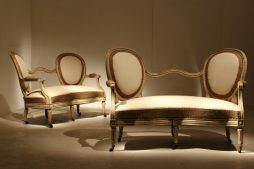 This antique French gilt wood sofa matches the pair of salon armchairs & the pair of side chairs also on this site. The whole set can be seen together in one of the images below. 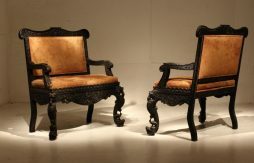 The frame has intricate carving on the back & fluted legs. Like the rest of this suite the gilded frame is in original condition with the red showing through beneath the gilt work, which gives it loads of character. 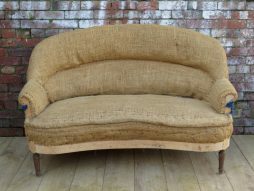 I would date this sofa to around the 1850’s period & I believe the fabric could also be original. 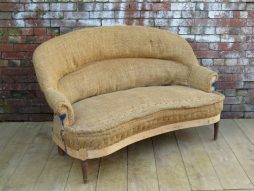 It obviously needs re-upholstery & we can arrange that for you if you like, or you can buy as is. We would rather sell the whole set together, but they are being offer separately at the moment. 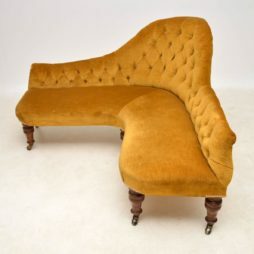 Very unusual antique Victorian corner chaise lounge dating to around the 1860-80’s period on mahogany turned legs with original brass casters. I’ve never come across a chaise lounge of this corner design before & I think it’s works quite well, plus very practicable. 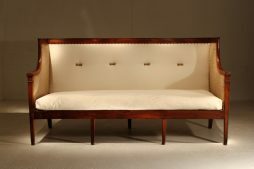 The upholstery was on this piece when we got it & is in fairly good condition with no damage, just a few minor markings that you can see in the images if you enlarge. What’s nice, is that it feels like the original horse hair underneath the fabric. It’s deep buttoned, well sprung & braided. 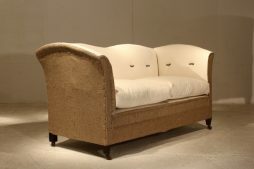 If you want it re-upholstered, we could arrange that for you. 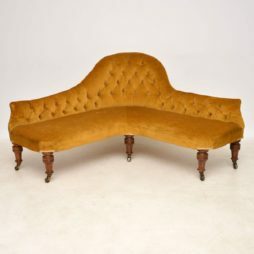 This chaise is a classic Victorian shape. It’s like a spoon back chaise lounge with an extra extension on one side. 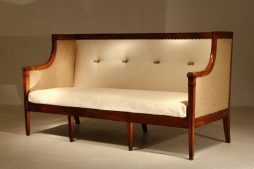 I don’t think you will see another chaise of this design. 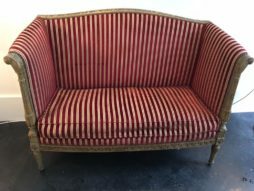 This decorative and elegant 2-seater sofa is upholstered in burgundy striped fabric , while the paint of its carved wood frame has nuances of beige and gold. Antique Swedish leather Chesterfield sofa in great condition & dating from around the 1890-1910 period. It has a deep buttoned back, sides & arms, plus a fully sprung seat, so is very comfortable. The leather is in excellent condition & full of character. The seat is quite deep, so you can curl up in it. 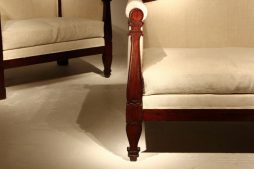 It sits on turned mahogany feet. 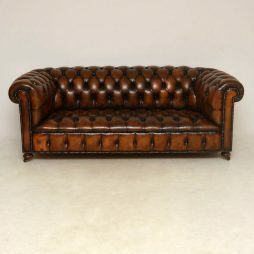 Antique Swedish leather Chesterfield sofa with a deep buttoned back & arms, sitting on mahogany feet with brass capped casters. It’s in good original condition & dates from around the 1910 period. 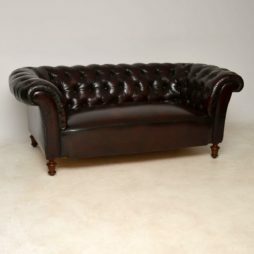 This Chesterfield is of extremely high quality & is also very comfortable. Please check & enlarge all the images. It’s covered in a soft brown hide & there are no splits, tears, or holes. The buttoning is nice & deep. The front of the scroll over arms are also pleated. 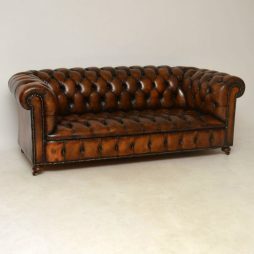 It’s been a long time since I got hold of a leather Chesterfield sofa & this one is a lovely model. 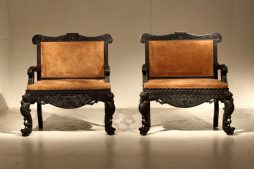 The leather is in good condition with a wonderful original antique look. There are no splits, tears or holes & the leather has just been professionally revived. 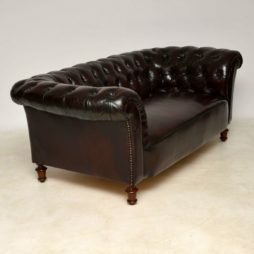 It’s deep buttoned all over, hand tacked & sits on mahogany feet with metal casters. Please enlarge all the images to appreciate the depth of buttoning & the condition of the leather. 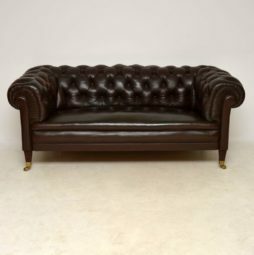 I would say this Chesterfield dates from around the 1930-50’s period, but it does look Victorian. 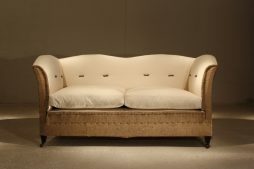 Good quality, late 19th Century English sofa. *These items are our new deconstructed look, using high quality heavyweight calico and also a heavyweight natural burlap ( hessian type ) fabric. 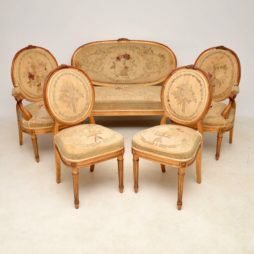 Unusual, French late 19th Century sofas with serpentine front and original paint. 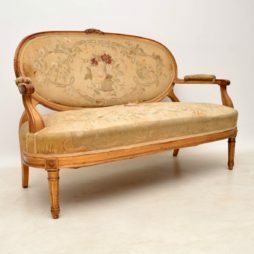 Wonderful shape, good sized mahogany French 19th Century sofa. 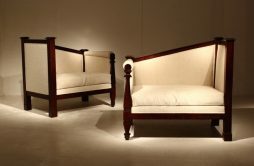 Pair of small, French,19th Century mahogany sofas.